LEN - www.lankaenews.com | Until UNF forms separate govt. in 2020 with a majority , the govt. will go on after elections ! Ranil –no doubts about it! Until UNF forms separate govt. in 2020 with a majority , the govt. will go on after elections ! Ranil –no doubts about it! (Lanka-e-News - 01.Feb.2018, 2.45AM) In order to avert the precious motherland from being plunged into further defeats and fiascos owing to the insanity and imbecility of the country’s leader who is conducting himself like a two legged donkey; eroding the country’s credibility before the international community ; unheeding the constitution ; uttering all the lies ;and himself proving beyond doubt as most unsuitable for the post of a State leader , the United National Front (UNF) which has the majority in parliament has taken a crucial decision to form its own government after the forthcoming elections. This decision was taken by all the constituent party leaders of the UNF as well as the leader of the UNF, Ranil Wickremesinghe. It is their opinion , since the present president was propelled to the presidential post by the leaders of these parties , they should see to it they work without entering into any conflict with the president. Though the foreign states rendered assistance to Sri Lanka , the present government was only nominally a consensual government while in fact what is existing in SL is a dual government. No State in the world is inclined to maintain relationship with a State run by a dual government. Although the P.M. for the first time made this revelation to the public at Anuradahapura on the 29 th. , the media of the country did not give due publicity to it. The P.M. at Anuradhapura said, following a decision taken by his party leaders , the UNF will retain its majority and the government shall be continued until 2020, and in addition will work together with president Maithripala Sirisena . He also asserted whatever that were planned by this government will be continued ,and requested the people not to harbor any doubts in that regard. 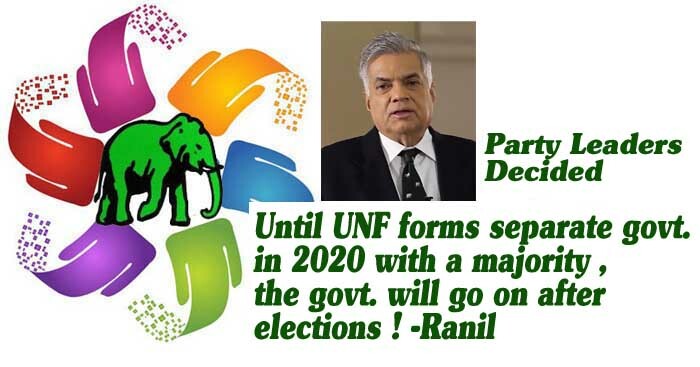 In order to fulfill these goals , he urged the public not to stay at home at the upcoming elections , instead go the polling booths and vote for the Elephant symbol of the UNF. The principal aim of forming a national government is to resolve the national issues which were hitherto unsolved. To fulfill that aim what is central is the introduction of a new constitution which abolishes the executive presidency , and decentralizes powers towards a sustainable solution to the national issue . However the bankrupt politicos and the defeated SLFP ers did not honestly contribute towards that objective . What they did on the contrary was , wasting the time on making a fool of the president and taking him down the garden path to undermine the other faction of the national government ,while hatching conspiracies thereby hampering and hindering the fulfillment of the national goals. In any event the agreement that was signed when forming a national government has terminated. Though the president is bragging that if he has 96 he can form a separate SLFP government , with him there is a very small group ,about 46 in number. Lanka e news was the first to reveal this in its report captioned , ‘UNP ready to form separate govt. India and US express their consent!’ on 5th January . If the SLFP group of Maithripala in the consensual government secures second place , they have a right to form a consensual government. However if it secures third place , it has no moral right to form a consensual government .Even the president ‘s right to be in that position is dented. If the Maithri group secures fourth place , the president will have to immediately resign , his moral rights notwithstanding.